We must grant that WikiAnswers is scarcely an authoritative reference source, but it does offer a window on popular culture. It reflects that a common reason (and perhaps the most common reason) for the societal “doing” of music today is to forget the pain, grief, anxiety, dreariness, and simple ennui of life and enter an imaginary world where one can have the emotional experience of his choice—usually a happy one. Ironically, the historically central idea of “music” (fr. the Grk. μοῦσα, to muse, think, remember, or reflect) has been transformed in the last century into its own etymological opposite—an occasion, whether active or passive, for not “musing,” or, supplying the alpha privative, a venue foramusement. This is not to say that music as amusement or as a means of forgetting is always bad (see in principle Prov. 31:7), but it does reflect a total reversal of the Western tradition concerning the central purpose of music. Of course, history only slightly improves on Wiki in terms of warrant. Still it is interesting to know that the perceived function of music from the classical period to the rise of populism was as an aid to musing and remembering, or perhaps better, as a means to creating the affective distance necessary to fostering reflection. The theme of music as an abstract idea is rare in Scripture. The Greek term μοῦσα appears only once in the NT (Rev. 22:18). More common NT terms reflect instantiations of music: ᾄδω (oding), ὑμνεω (hymning) and ψάλλω (psalming). Hebrew is slightly more fruitful—the most common Hebrew word group for music, the שׁיר word group, includes in its scope not only “singing,” “playing,” and “songs” but also the more abstract idea of “song.” Most of what we know of the purpose for “song,” though, we learn from the songs: they provided a platform for mutual and reflective praise, joy, thanksgiving, lament, hope, victory, and the recollection of the works of God. Music engages the whole person in spiritual discourse, slowing the flow of information to the mind, facilitating reflection, awakening chaste affections,* and encouraging appropriate motions of the will. In short, it allows the musician to muse. Music is also an effective mnemonic device. With its penchant for artistic cadence, repetition, rhyme, poetic devices, etc., music helps us visualize and remember the propositional content that attaches to it. Music balances immanence with transcendence. Music causes the individual musician to step back, consider abstractly his place in the universal metanarrative, and then resolve to fulfill his duty/destiny. Music creates a requisite sense of community. Music helps us see not only how we fit into transcendent realities, but also how we share experimental solidarity with others (whether fellow-Christians, fellow-countrymen, fellow-soldiers, etc.) in common worship, grief, joy, hope, recollection, affirmation, or action. In my selection of music am I more concerned about musing or about amusing? In other words, does the music cause me to remember/reflect or to forget/release? Do I make musical choices based on whether they will awaken my affections or stimulate my emotions? Is my music strictly about the here-and-now or, conversely, strictly about the wholly other? Or does it attempt to integrate the immanent with the transcendent? Does my music complement the lyrics and cause me to remember—both as I sing and afterwards? In my choice of music am I more concerned with personal expression or with expressing public and experimental solidarity with a community? It is impossible to escape the fact that the function of music has changed radically in the last century—in ways that have never before been seen in the history of mankind. And the church is understandably having a hard time adjusting. While reflection and resistance have occurred at times in the Christian community, the Church as a whole seems to have reached an alarming watershed—a consensus decision that (1) there is no profit in philosophizing and theologizing about aesthetics, that (2) the threat of being aesthetically “of the world” does not exist, and that (3) the threat of not being aesthetically “in the world” is by far the greater crisis of the evangelical church. We must be frank in admitting that some who have attempted to parse the paradox of Christ and culture in the aesthetic sphere have done so poorly. But this does not give us a pass, as ministers of the Word, from being proactive in parsing the paradox and thinking meta-musically. And even when we tire of shrill and uninformed voices on both sides of the debate, we surely must not become angry or dismissive toward those who persist in the exercise. We may not all come to common conclusions (like ethics, music can be quite abstract), but we cannot be so foolish and atheological to imagine that aesthetics have at long last been detached from ethics within the Christian worldview. It is impossible to escape the fact that the function of music has changed radically in the last century—in ways that have never before been seen in the history of mankind. The introduction of recorded music by Thomas Edison in the late 19th century was the critical turning point. For all of human history up to that time, music was something done by people in real time and place. If you wanted music, you had to either perform it yourself or if you were rich you could pay someone to perform it for you. And whether you go to a concert or participate in an informal jam session, we know that being in the same room with someone performing music is a very spiritual experience. Recorded music changed all of that. Recordings made music more accessible to the common man, but they changed music into a commodity. Music was something that was bought and sold in a store, a series of grooves in a cylinder or disc and later a series of bits in a computer program. Music became the domain of large corporations. "And the church is understandably having a hard time adjusting." Could it be because The Church (in The West, at least) has not come to grips with what they say they believe: ‘That the scriptures are our final authority in matters of faith and practice.’ We draw near with our lips to this truth, but our hearts are far from it. In effect, we do NOT believe it, and are thus adrift without an anchor on a wild and restless sea (Eph. 4:14-16), denying Him who walks on the raging sea. Thank you Dr. Snoeberger, for your musings on music. These are 'worthy' thoughts. I appreciate that this article can be applauded by people on all sides of the music debate. Dr. Snoeberger condemns the worse excesses of both contemporary and traditional worship music. I do detect a little of the good doctor's personal leanings, but I appreciate the position that he takes. But my first response to the articles is to wonder whether aesthetics are universal or culturally bound. I'm not sure that I can fully get lost in the beauty of beautiful Middle Eastern music; and I doubt that a Christian in Timbuktu will appreciate the majesty of Handel's Messiah. Does culture affect aesthetics? I have known some people that claim aesthetic beauty is bound up in one culture and that all other cultures have lost their way. Of course, this reeks of ethnocentrism. So how does one arrive at a properly defined and philosophically consistent view of aesthetics? For instance, I appreciate Scott Aniol's work on affections and aesthetics. When he came to my church and then also spoke at MBBC, I enjoyed the first half of his presentation that focused on these topics. But I then felt blindsided by his conclusions and applications. As best as I can tell, there is a very large gap in the discussion of aesthetics as they relate to music. Up to this point, the work that I have seen in this realm has a clear understanding both of what God wants and of what they want to give to him...but the connection between the two has not been fully developed. Does culture affect aesthetics? I have known some people that claim aesthetic beauty is bound up in one culture and that all other cultures have lost their way. Of course, this reeks of ethnocentrism. So how does one arrive at a properly defined and philosophically consistent view of aesthetics? This is, I think, the $64,000 question. I've argued that modern music can be acceptable even though it doesn't match up to typical Fundamentalist culture. I've seen people argue that modern music is not acceptable because it doesn't match typical Fundamentalist culture. That is not the typical argument, but it does exist, and it's essentially an argument based on an experiential and selfish perspective. I agree with you that Dr. Aniol's presuppositions are solid, but it's the application that I disagree with. That seems to be the case with the others on SI (Harding, Bauder, others). So how do we cut this Gordian knot when it seems like we agree on the Biblical principles and disagree with the application? I agree with you that Dr. Aniol's presuppositions are solid, but it's the application that I disagree with. Jay, I'd probably go so far as to say that I actually prefer their application, but since I cannot make a solid argument for that application, I must give liberty to those who do not apply it like they do. I am thankful for those who understand that, but I am saddened that some think I am a trouble maker because I just want to be honest in my position. I fear that is what frustrates some of the "young fundamentalists." As they strive to be Biblical in both their exegesis and application, sometimes they do not fall in line with the traditions of past fundamentalism. I recognize that there are also some guys who just don't care what the Bible says and want to be hip and cool, but I would hope that some of the "older fundamentalists" would recognize that not all those who come up with a different application are in that category. I guess I consider myself a "middle aged fundamentalist" but Joel would probably call me a B+. Since I tend to rub shoulders with more of the "older fundamentalists" I find myself dealing with their position more often, but I would also hope that the more contemporary guys would recognize some of the reasons why the traditionalists chose the music that they do and not try to change those of us who want to be traditional while not decisive. I wrote decisive, I meant divisive. I think the spell check correction got the best of me there. Speaking on music outside worship, is one worse than the other? Are all affections and emotions bad? Does a ball game do either of these? Does it or music have to do this? Again is this a biblical requirement? To me it seems simple, in the assembly all towards Him, outside the assembly I see nothing that speaks against enjoying anything not deemed by scripture as sinful. Music in modern western society is TOO important and TOO pervasive. The Reformers (Luther in particular) are often quoted to talk about the importance of Christian music PRECISELY BECAUSE NO SCRIPTURE ranks it as highly. Music is a function of being human, in the image of God, as is so eloquently argued above. It is not merely the domain the most talented, but we are admonished to sing to one another in Psalms and hymns and spiritual songs, not just for trained voices to sing. Like prayer, it is the domain of every Christian, not just the gifted (unlike teaching or exhortation). And, like prayer, some people are better at it than others. Sadly, music is the war department of the church probably because we over-value it. It has so melded to the idea of worship that the terms are (practically speaking) now inseparable. This ought not to be so. I consider myself a great music lover (although my tastes focus on 20's and 30's popular jazz), but I think the emotional nature of music lends toward confusion between the spiritual and the emotional. The Holy Spirit working in us leads us to worship God as part of who we are, with or without music. But music -- secular or sacred -- effects our emotions on a unique level. 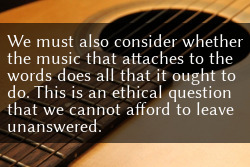 We need to come out of this inflation of music's importance; important, yes, but not to the degree we often make it. Ed, I was going to post something similar. Gone are the days when a typical congregation sings a couple songs for about ten minutes, and then settles in for a 45 to 60 minute exposition of the Scriptures. No, now its 25 - 30 minutes for congregational singing and special music, and by the time the sermon is to be preached, the congregation is exhausted. There is a scant 30 to 35 minutes left for the sermon(ette). But this reflects our culture where everyone thrives on ice cream when they need to eat root vegetables and green veggies. Where church music was supposed to sharpen affections and draw worshippers to a preparedness for the preaching, the music has often become an end in itself. Its what draws people into attendance, and if its not sufficiently performed to their liking, people will leave and find a church where it is. People will throw their hands up, clap, and otherwise release their emotions during the 30 minutes of singing, and then slump into their pews and endure the comparatively emotionless sermon as their minds wander towards their plans for the Sunday afternoon. Darrell, it's worse than that. Music equals worship, preaching does not. Who can worship too much? That's the modern fallacy that has conquered much of evangelicalism. The Word gets the shaft, you are right. Music used to be a ministry, a way to minister to the Body. Now the body exists for music (worship). How does that go, "He who controls the terminology wins?" I don't know who this guy is, but he has an interesting perspective on worship music in church. I find it ironic that very often the same people who say they aren't going to separate over music, that music has such a small impact on a person's sanctification, that music is a minor issue . . . .
. . . . . . are at the same time extremely touchy about music especially when it comes to music in the church. Ever tried to "discuss" music in the church with most people who are really into CCM?? You would've thought the world had just ended if you said you disagreed with them about it. Fundamentalists do not always get music issue right, of course. From my perspective the difference is the CCM crowd often says music is a small, minor issue while at the same time they go gaga over the latest group or band. The fundamentalist crowd is the opposite. A balanced perspective on both sides please! Music is primarily about emotion and taste, IMO. The words are more objective, but, frankly, often do not penetrate the mind, not matter what style. People sometimes prefer the old hymns because they bring the comfort of familiarity while some enjoy CCM to rouse them perhaps. The war between serotonin and epinephrine is very much involved in all this. That music (singing to one another in psalms and hymns) matters is clear because the Word of God commands this, so it is not that these things are not important, but they rank way under loving God and loving others and are a sub-category of edification, IMO. To obey is always better than sacrifice, even though sacrifice is commanded and part of obedience. It is when we make the part the whole -- or inflate it, as is done with music -- that we displace something more important, like full obedience or love. So it is not just an issue of style, but priority. Music in general is not as important as we in the West make it. Important, but not THAT important. We just like it a lot. I am not saying that the love of music is wrong, but we can rationalize and spiritualize our love for music as a love for worship. People who spend lots of time in prayer might be believable in this area, but people who have little interest in the Word and prayer but love to "worship" with music make me suspicious. But, in another vein, our obsession with music in the culture means the church becomes more seeker-sensitive, in a way, when it has excellent music and a lot of it. One style draws one crowd, another style another crowd. Problem is that I am not into the seeker-sensitive approach Yet the emphasis in the western Christian world on music, if you think about it, is the germ from which seeker-sensitivity became viral. While I agree with you that this is an existing problem and that it is far too common, I should note that at the church I attend, we have approx. 20 minutes of congregational singing to modern music and hymns with an hour (sometimes more!) of exposition. I've been very happy to be in a church with these priorities. If exegesis and exposition is done properly, and the people are being fed through preaching, they will stay. "In modern churches, we have a graven image of what the experience of God ought to be like, and we want our music to simulate that experience in us. It could be an organ or a praise team—either can create a God experience that may not have any of God in it at all. But people will feel like they’ve worshipped. And because the existential experience of God is more important to us than the [actual] experience of God, we’re satisfied—wrongly, I would add. If it feels impossible to worship God through styles that are uncomfortable to us, it’s because we’re asking the music to do for us what is actually an issue of the heart. The problem with the “worship wars” is that they’ve hidden the real issue: We are in love with ourselves, and we blame the music." Jay and James, thank you! Rock appropriate in church - but not at a memorial service? You know, I was struck again by the whole music debate this morning. I live in Prescott Valley, AZ where the memorial was held this today for the 19 hotshot firefighters killed in the Yarnell Hill wild fire June 30. As I was watching the memorial service on tv, it hit me how inappropriate it would have been considered by everyone to have played rock music during the memorial. Instead we heard choirs, orchestration, flutes/lutes and bagpipes - but no rock music. It remains inconceivable to me how anyone can continue to argue that music (apart from the lyrics) does not communicate. The message communicated by rock would never have been considered appropriate in that setting, no matter what the words might have said. And if music does indeed communicate, it is impossible for it to be amoral. Let me echo Tyler's comment. Excellent points. Very true that music is not amoral - unless of course it is CCM then we are completely free of such petty, narrow restraints. ;-)! BTW, very sorry to hear about the lose of those firemen. Condolences to the families and that community. Glad you guys have figured it out. Now, if any of you have some spare time, maybe write a manual for us that tells us what music communicates what. Who said anything that church services should sound like a funeral? All else aside, I have done a number of funerals with rock or country or pop music played at them, even from iPods or IPhones held up to the little mic on the podium at the funeral home. People there seemed to think it was appropriate, which may say something about them, about the culture in general, about the meaning of music being understood differently by different people, etc. But this happens more often than most here would think probably. Not sure what that really has to do with the debate. But, when I heard this song a few years back, I told my wife that I want this to be played at my funeral. My guess is that some here will classify this as rock music. The message I received in this song was and still is very powerful! I want this song, in this style, to be played at my funeral. Rock music or no (listen to at least 1:32)? It's the traditional march played at the end of a tattoo. when the pipe bands march out. mmartin, I was merely suggesting that music can convey some emotion...but the lack of what Chip broadly terms 'rock music' does not prove in any way that 'rock music' cannot be used to worship. Furthermore, I imagine that Handel's Messiah and the Ode to Joy were also absent from the memorial service. If we were to consistently develop Chip's statement, then we would conclude that it is inappropriate to play those in a worship service. Chip would obviously take umbrage with that application of his argument and he would then explain that the message was not appropriate to the occasion, but that the music is still appropriate. But I think we can agree that the musical refrains themselves would be inappropriate due to the emotional response that they inspire. Thus, I conclude that Chip's comments about worship music should actually be limited in their scope to what they can actually reasonably prove. Some music is appropriate for a funeral because it communicates certain messages via its text and style. If he attempts to prove anything more than that from his observations then he is forced to apply his own principles inconsistently. If you want to prove that something is wrong, then you have to do it scripturally, philosophically, and consistently. A blanket statement about funereal music choices does not (and cannot), negate the wonderful and majestic music put out by modern artists. It has re-emphasized the joy of singing/music in church and it has captured the hearts of God's people. You cannot steal back the hearts with funereal music unless you can sufficiently convince the minds of God's people. A logically limited point cannot construct a sufficient framework to accomplish that task. That is my point.